My, my, my. Gas Powered Games, what have you done? I didn’t like the original Supreme Commander all that much, but I respected it. It had a goal – something to make it stand out from the herd of lowing, braying RTSes it would otherwise have been lumped in with — and it single-mindedly pursued that goal. Arguably it achieved its aim of grand-scope real-time strategy on a scale not yet seen, but this came at a price; it had no character. 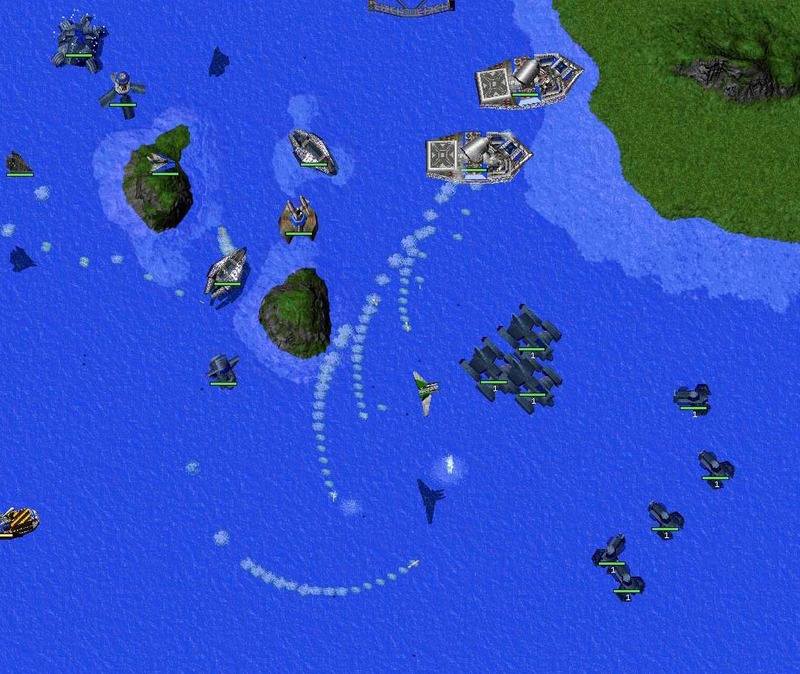 I look back at Total Annihilation, and while there are some nothing units and some dull maps (the metal planet), my enduring memory of the game is one of Peewees, Brawlers and Big Bertha artillery duking it out with Sumo heavy kbots and Rapier gunships over lush, vibrant terrain. Just look at the colours here. Everything stands out, and most (but not all) units are identifiable at a glance. Compare this to Supreme Commander, where the main word that comes to mind when I try to describe it is sterile. Joyless. Soulless. It took no pleasure in its wanton desctruction and it made no attempt to inject any warmth into its maps or character into its units. 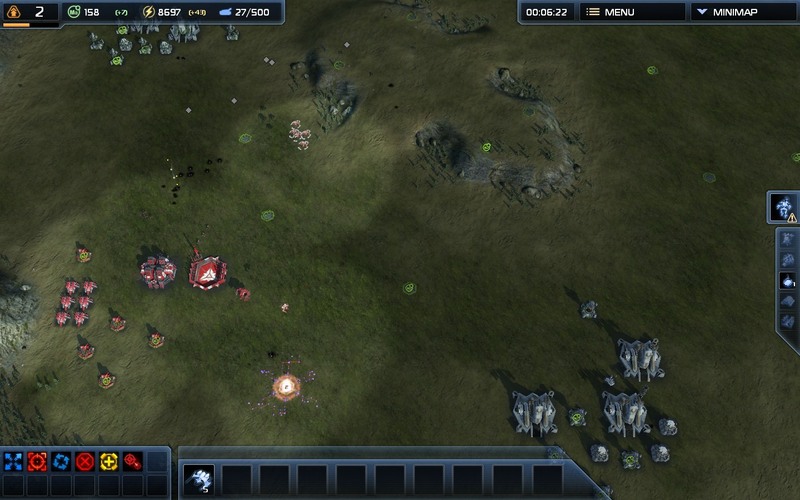 By taking the strategic zoom all the way out to low orbit Supreme Commander severed my connection with what was actually going on on the ground, making battles oddly dispirited, disjointed affairs, and I swiftly lost interest. The scale ensured I remembered it, but the actual gameplay meant that memory was a bad one. But now! Now (or about eighteen months ago) there is another one of it. Judging from what GPG have done here, I suspect my problem with the original may not have been all that uncommon. GPG have picked up on that particular complaint. However — this being GPG, the straight-faced perpetrators of the crime against humanity that is Space Siege — instead of trying to up the ante with imaginative units or colourful visual design, Supreme Commander 2 instead strips out the one thing that was interesting about the game in the first place: the scale. The dull units and boring maps are still present, it’s just that the maps are now roughly the size of a postage stamp. I bet you think I’m joking. Ho ho ho, that scamp Hentzau, always exaggerating things he doesn’t like for comic effect. Well, that’s true sometimes, but not here. For example, the above picture is a 6-player skirmish map that was laughingly labelled “FFA”. I took this to mean I could happily stack the game with five AI players on different teams and orchestrate a nice hour-long symphony of slaughter, and so I was very surprised when, ten seconds into the game, one of the enemy commanders walked out of the fog of war and started trying to blow up one of my metal extractors. The six bases weren’t even spitting distance apart; they were literally adjacent to one another. This map wouldn’t even qualify as a duel map in another RTS, and here it’s rated as being able to accommodate six players. The resulting game was the pointless scrum you’d expect, with bugger all strategy involved except chucking as many units as I could against the opposition. I mean, when you make the maps so small that maneuver is impossible, can you really call it a strategy game? I don’t think so. RTSes are already bloody anaemic in terms of the S part; you take out maneuver and all you’re left with is mindless tapping on a series of build buttons. Vulthoo. Vulthoo. It’s a made up word that sounds like a cute anthropomorphic animal from a children’s animated show, for god’s sake. Many of the unit names in Total Annihilation were evocative of what the unit did, but the unit names in Supreme Commander don’t mean anything at all and it’s telling that they’re all referred to by what they do (Anti-Aircraft Artillery and suchlike) rather than what they are. The result are three factions that are only really distinguishable from each other by the aforementioned simple visual design; the research trees they get may be slightly different and they at least get unique experimental units, but they’re otherwise functionally identical. 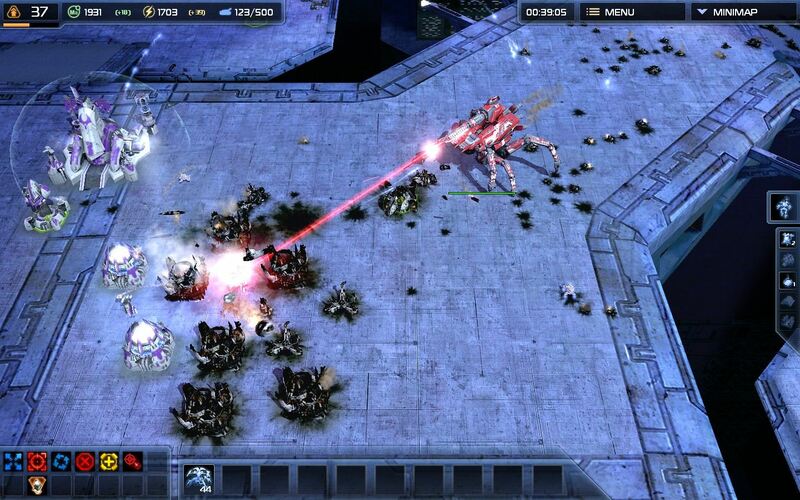 This is not the way you build a compelling and varied strategy game; in fact, I get the impression there may have been a conscious effort to dumb it down, scale it back and strip out everything that was interesting about Supreme Commander in order to appeal to a wider audience (i.e. Xbox 360 gamers). Supreme Commander 2 is not completely useless. 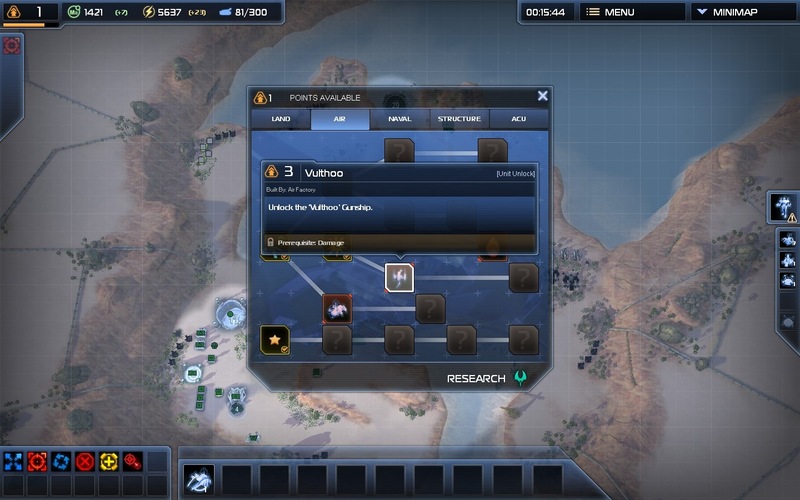 I did like the concept of the research trees, which showed some potential with their unit-specific upgrades like extra cannons for tanks or giving AA units a direct fire ability. That would have made a fine addition to the game had they explored it properly, but instead it’s mainly used as an excuse to add an entirely pointless third resource to the game (research points) and to lock off the majority of the game’s units from you until you’ve researched them, making it a handicap rather than a boon to play. The addons to the basic structures you can build might also have gone somewhere interesting had they let you do it to more than factories; as it is, like the research it winds up as the seed of a good idea left to die in the dessicated husk of what could have been a promising failure rather than the unmitigated disaster that Supreme Commander 2 actually turned out to be. The real mystery to me is how Gas Powered Games has fluffed up not one but two iterations of Supreme Commander. Total Annihilation was a fine game, but it isn’t like it had a particularly complex formula that’s hard to reproduce (as evidenced by other RTSes stealing the best mechanical bits like build queues). And yet here we are fifteen years later and we’re still bereft of a decent successor to it. Gas Powered Games was founded by Chris Taylor, right? The guy who designed TA in the first place? Did he have a lobotomy between then and now, or was Cavedog merely staffed with far more talented people than the ones he hired at GPG? I don’t think we’ll ever know for sure, but what I do know is that Supreme Commander 2 is an awful game that represents one of the true nadirs of the RTS genre. Avoid. While I don’t believe it to be awful personally (I only beat the campaign), it pails in comparison to Forged Alliance (as do most other RTS games in my opinion). They went for accessibility, sacrificing depth in the process. It pains me greatly to see such a wonderful franchise get crippled this way. Oh god the campaign. I completely forgot to mention that, probably because my mind protectively blanked it out. 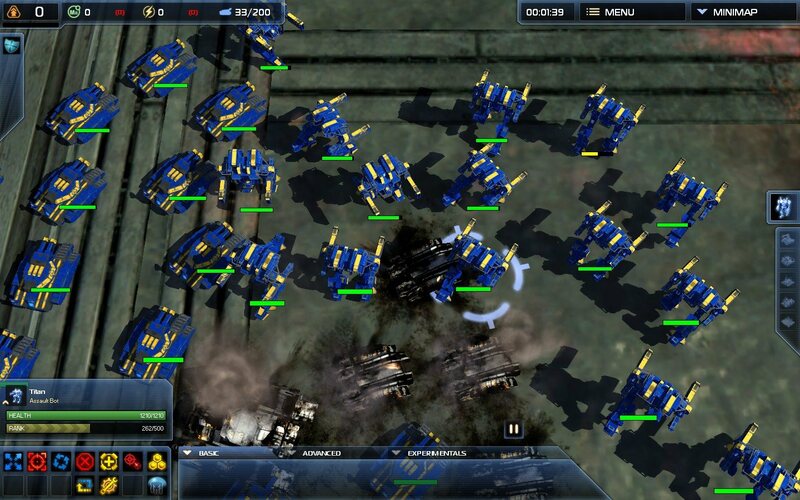 I was a big fan of Supreme Commander, but I was horrified by SupCom 2. I wrote a lot of bad reviews about that game because they dumbed it down for consoles. Chris Taylor must have needed the money badly to allow that to happen to his franchise game. That’s what I believe happened. What’s worse is what they did to Dungeon Siege 3. This may horrify you, but I actually quite liked Dungeon Siege 3. The genre shift from Diablo-alike to true action RPG did it a lot of good and the writing from Obsidian didn’t hurt, either. I’m not saying it’s the greatest game ever or anything, but I don’t regret the time I spent playing it last summer. Wouldn’t play it again, mind. I’ll have to say Supcom 1 is probably the better game compared to TA. It has its issues but is nearly a universal improvement in every respect. And is probably singularly the only true Strategy with a capital S RTS ever(!). I’m not sure why you think there’s no character to the units either, there’s not as much as there could have been for sure and a lot of them are the same from faction to faction. But there’s a lot of unique and memorable units in there too. I think you’re just viewing TA with rose-tinted nostalgia goggles here, and letting that cloud your judgement on Supcom. Not that TA is a bad game, but I think Supcom is better. Supcom 2 however, we can both agree, is an abomination. Eh, it’s probably a matter of preference. My main problem with SupCom is one of tone rather than design, and the way tone is perceived is rather subjective. I did have *some* fun with the game so it certainly wasn’t all bad, I just think TA was, for the time, a far better effort. But yes, the main thing here is that SupCom 2 is garbage. I applaud you for putting into words succinctly what I’ve wanted to express for years. i can remember epic battles in TA almost 20 years later (one in particular where my brother maneuvered his AK kbot squad into my fusion farm and caused an explosive chain reaction that crippled my entire base. By the time the screen stopped shaking, most of my base and defenses laid in ruins. In contrast, I can’t remember a single operational battle in SupCom or SupCom FA. I wish someone would make a revised TA. I’ll also add that TA’s environments WERE lush and vibrant, filled with trees which served as tactical considerations for both commanders alike. In SupCom and SC:FA, the environment is as bare as the aftermath of a bikini wax. Sure you may have a few trees here and there, but for the most part, the terrain is uninspired, insipid, and plain boring. Funny enough, the same can be said about the units in SupCOm themselves. But in TA, who doesn’t remember seeing a wave of Can come hobbling toward your base? Ah, I loved Cans. And after the first expansion, I loved Sumos as well. They may have moved at about 4mph but they just didn’t stop, so if you had an army of Sumos and Cans and set an attack order in the enemy base it’d be crushed by this implacable wave of disco-laser death. I also enjoyed the ludicrous super-weapons like the Big Bertha machine gun, as well as having the option to turn the damn things off if I wanted to. TA was just a supremely well-judged game in all respects, really — not ridiculous, but just over-the-top enough to make it fun. I agree, Hentzau. I also especially agree with the fact that the ability to zoom out in SupCom and SupCom2 completely obliterated any affinity and caring I had for what happened to my army. When you watch some SupCom and SupCom2 replay videos on YouTube, they mostly depict the action when zoomed all the way out and units are represented by colored dots. Who can be interested in watching dots? Not I.
TA videos show the battle up close and personal. There’s nothing more exhilarating than watching T3 units finally crack an enemy base’s defense perimeter and have scores of T1 units push through for the death blow.